Margaret Atwood. Moral Disorder. A Reader's Companion and Study Guide. 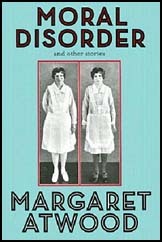 "In Moral Disorder, Margaret Atwood has created a series of interconnected stories that trace the course of a life and also the lives intertwined with it—those of parents, of siblings, of children, of friends, of enemies, of teachers, and even of animals. As in a photograph album, time is measured in sharp, clearly observed moments. The �s, the �s, the �s, the �s, the �s, the �s, the �s, and the present— all are here. The settings vary: large cities, suburbs, farms, northern forests. By turns funny, lyrical, incisive, tragic, earthy, shocking, and deeply personal, Moral Disorder displays Atwood抯 celebrated storytelling gifts and unmistakable style to their best advantage. As the New York Times has said: "The reader has the sense that Atwood has complete access to her people's emotional histories, complete understanding of their hearts and imaginations." "The Art of Cooking and Serving"
"The Boys at the Lab"